With a title such as Drone #1‘s, it can be very easy to think of it as a purely military, patriotic spy-fest. However, Drone #1 adds just enough surprises into the mix to give it a whole different angle. Two former predator drone operators face insurgency and insanity on the Las Vegas Strip in the surreal surroundings of the world’s first terrorism-themed hotel! This issue is a classic slow roller, which may be a good or bad thing depending on your point of view. Just a few pages in, it reads like a typical military espionage-flick, but the more subtle hints give way to a more abstract and surreal story. It’s here, in all honestly, that the title really comes into its own, mixing serious themes with a strange quirkyness. As far as the writing goes, it’s not without its faults. Chris Lewis pens a good script, but its hard to connect to any of the characters so far. The main protagonists, as such, appear quite flat. Still, the story itself is gripping and the cast has some small charm, in part thanks to Lewis’s sense of humor. 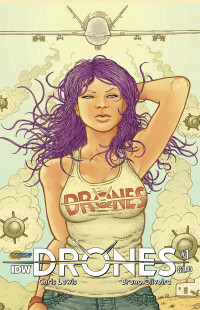 Visually, it’s very easy to fall in love with the art style of Drones #1. Bruno Olivera’s pencils are a little skecthy, but the looser style helps him create the right fluid or abstract tone when he needs to. Likewise, the colors from Anderson Cabra really pop and bring the comic to life, with a strong sense of color and tone. 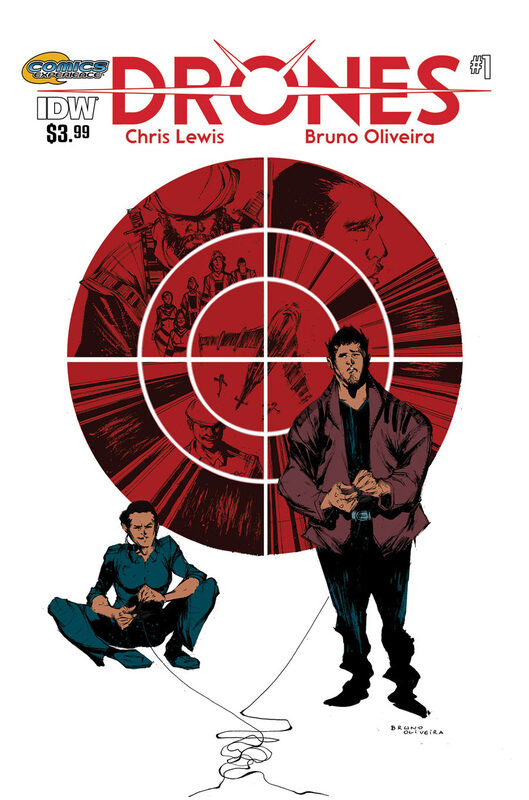 The two combine to create a varied comic that never feels too ‘samey’ for more than a few pages. All in all, this is a very strong opening for what could be a very interesting mini-series. Sure, it’s not perfect, but it’s come out with a strong show of force.